The Canadian Evaluation Society (CES) cordially invites you to participate in and support its 2018 annual conference, which will be hosted by the Alberta and Northwest Territories Chapter at the Hyatt Regency Calgary from May 26 – 29. This annual event is the largest gathering for evaluators in Canada, providing them with professional development at an unprecedented scale. This year’s conference is expected to attract an audience of some 500+ local, national and international participants. A high level of interest is generated annually at CES national conferences, as demonstrated through the receipt of on average over 450 proposals for workshops and presentations. Demonstrate your support for evaluation in Canada. Exhibiting at CES c2018 is an affordable way to connect with conference attendees active in the field of evaluation. Exhibitors provide a vital service in helping conference attendees learn about evaluation-related products and services. SFU Continuing Studies works with diverse communities, partners and faculty members to co-create and offer a wide spectrum of professional development opportunities. Our new certificate program, Evaluation for Social Changes and Transformational Learning, positions evaluation as a powerful and transformative learning tool. Learners will build the key skills and core competencies needed to design and implement meaningful, culturally responsive evaluation processes in a world where change is the only constant. The program fosters multiple, diverse ways of knowing, including a focus on Indigenous ways of knowing. Learners will have the opportunity to think critically about dominant Western paradigms and scientific methods, and challenge their thinking about what is considered evidence. We’ve designed our program for professional evaluators, grant-makers, internal evaluators, program managers, and leaders interested in evaluative thinking. Join an info session or find out more by visiting our web site. We are excited to launch the GGI Platform. The Platform brings together our growing network of associates (consultants largely working independently or in small firms) with leading edge management, collaboration, communication, research and analytical tools backed by a strong marketing program. So what does that mean for our clients…simply put, that means that we can now provide you with a wider range of innovative high-quality services, delivered faster and more cost-effectively than ever before by strong, diverse teams of consultants tailored to your specific needs. To find out more, talk to us at the Conference and visit our website, www.GGIPlatform.ca. The Canadian Journal of Program Evaluation seeks to promote the theory and practice of program evaluation. To this end CJPE publishes full-length articles on all aspects of the theory and practice of evaluation and shorter Evaluation Practice Notes which share practical knowledge, experiences and lessons learned. A third section of the journal, Addressing Challenges in Evaluation Practice, presents real-life cases written by evaluation practitioners. The journal has a particular interest in articles reporting original empirical research on evaluation. CJPE is a completely bilingual journal, publishing in both English and French. Readership includes academics, practitioners and policymakers. CJPE attracts authors and readers internationally. The CES plays a key role in contributing to the professionalization of evaluation practice across Canada. 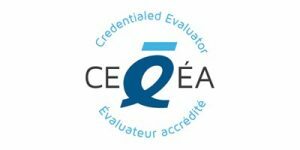 The CES Credentialed Evaluator (CE) designation is designed to supports professionalization efforts by defining, recognizing, and promoting the practice of ethical, high quality evaluation. The holder of the CE designation has provided convincing evidence of the education and experience required by the CES to be a competent evaluator. The process of obtaining the CE designation is rigorous, demanding, and introspective with maintenance requirements demonstrating commitment to the profession. CES celebrates Credentialed Evaluators by providing a public registry to promote competitive advantage. Images appearing on this web site, unless noted otherwise, are the exclusive property of CES, CES AB/NWT, Tourism Calgary and Tourism Yellowknife and are protected under Canada and International Copyright laws.